Today was the big day. The first half of the day was Frozen Lake Pass, quite possibly the sketchiest pass of the whole trip. We set off at 6am and immediately questioned our navigation. We knew the general direction we needed to go, but it took a bit to figure it out. 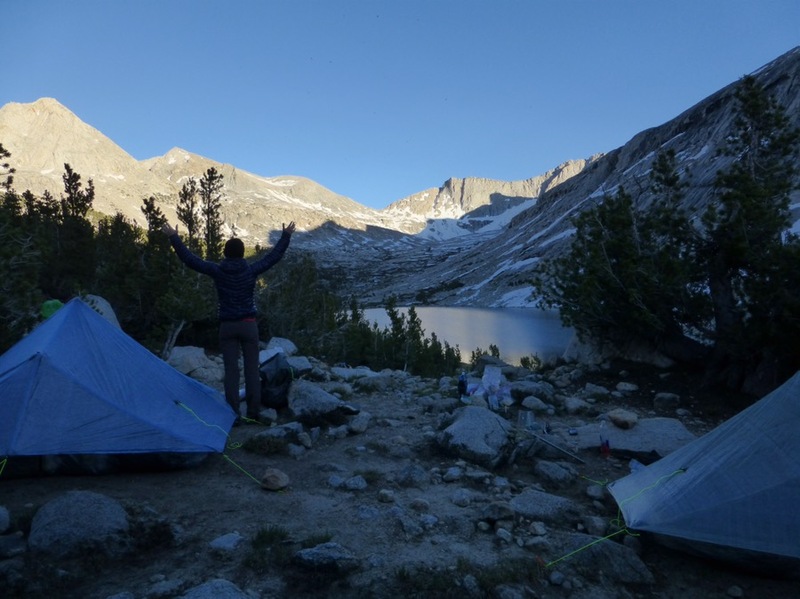 We overlapped a bit with the old John Muir Trail, so there was a faint trail that would appear every once in awhile. 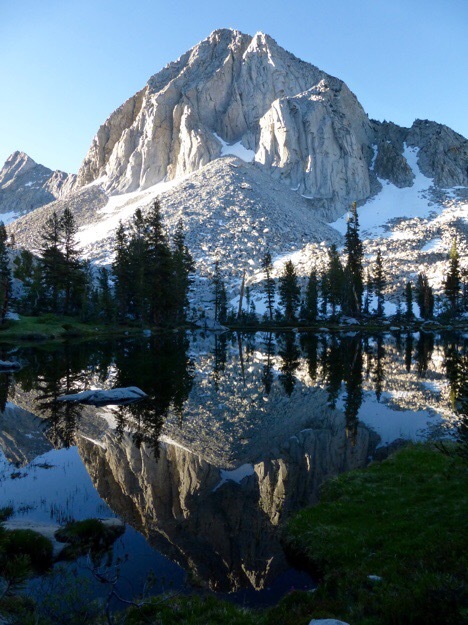 A really cool reflection of an unnamed mountain in a small unnamed lake. We had a large open area called Lake Basin and were having trouble matching the intentionally vague guidebook description. It was a beautiful morning though. We figured they were vague because you can’t do it wrong and just headed for the cirque that we thought was Frozen Lake Pass. Sometimes the tough thing with solely map and compass is that you can convince yourself that where you’re at matches what you see on the map. We knew some things weren’t right but convinced ourselves that we were just over thinking it. Turns out, we should have gone with our gut. When we climbed up to the cirque with the lake at its center, things weren’t quite matching and we weren’t sure which pass to go over. We agreed that for safety purposes, we needed to use the GPS for the first time. We looked and it was good that we did because it turned out we were at the wrong lake, dang! We were at lake 3515 instead of the one below Frozen Lake Pass. Rather than going all the way back and losing lots of elevation, we decided to go over the ridge dividing the two. It was mostly boulders, but again Why Not and Rockin’ were very patient with me in finding the least sketchiest option. 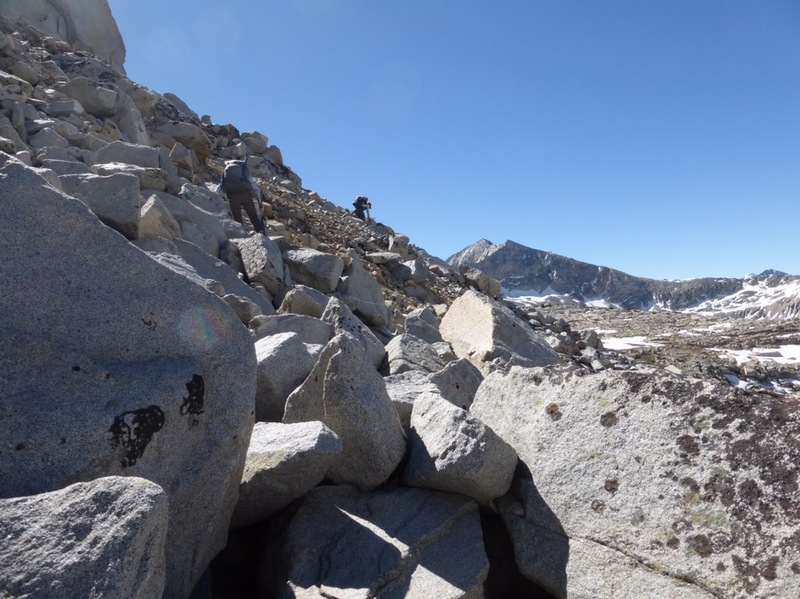 Traversing high and exposed boulders to get to the correct lake. Nope, not a fan. 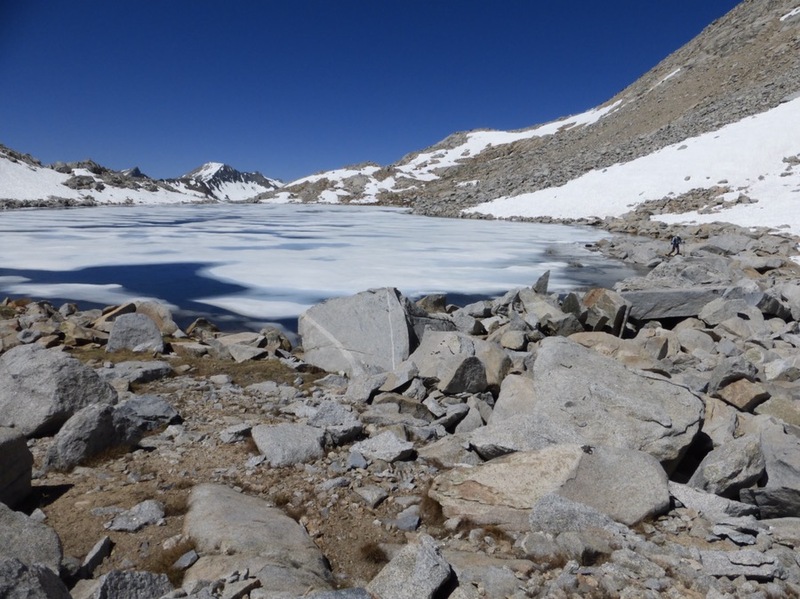 Once we finally got over to the correct lake, we needed to go over some boulders along the lakeside before heading up to Frozen Lake Pass. Notice Why Not on the right side of the lake. 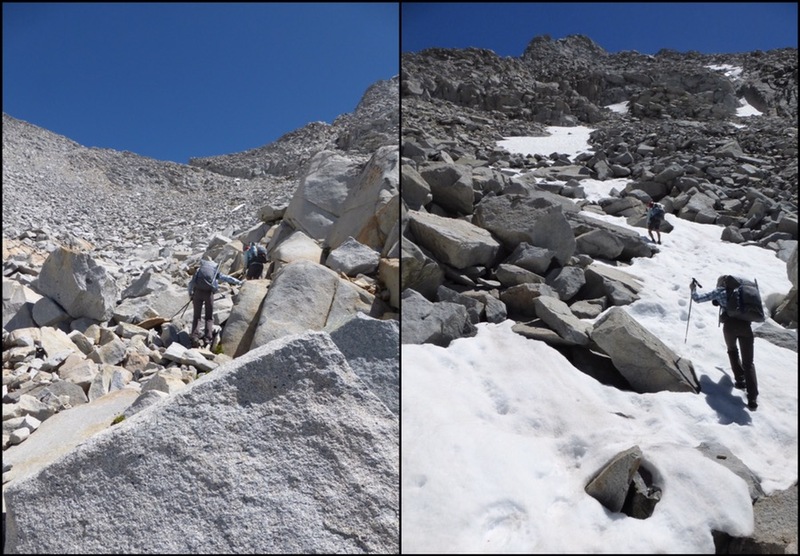 The ascent was a steep scramble over boulders of all sizes. Sometimes there was snow, but it seemed more helpful at times. We were pretty stoked to make it up, but we knew the difficult part was getting down. Fortunately, there was still a decent amount of snow on that north side. The steep loose scree up top for the first bit was worrisome and we were fortunate to only deal with it relatively briefly before hitting snow we could easily walk in. Going down Frozen Lake Pass. There is a SHR hiker that the ranger told us started the day before us. We have seen his footprints regularly in the most random and obscure places. We’ve found it comforting to see someone else is crazy enough to be out here. We’ve taken to calling him Kevin and feel a close bond. We had lunch by the frozen over lake at the bottom and admired our accomplishment. 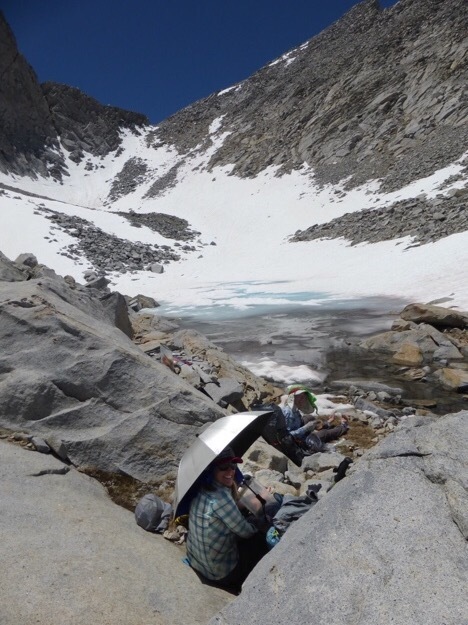 Lunch below Frozen Lake Pass. I’ll mention that my stomach is still not ok. It is cramping up when I even think about putting food in it. Rockin’ made me peppermint tea in an effort to calm it, but it didn’t work. As the day wore on, it got worse and I only ate half of what I normally would. 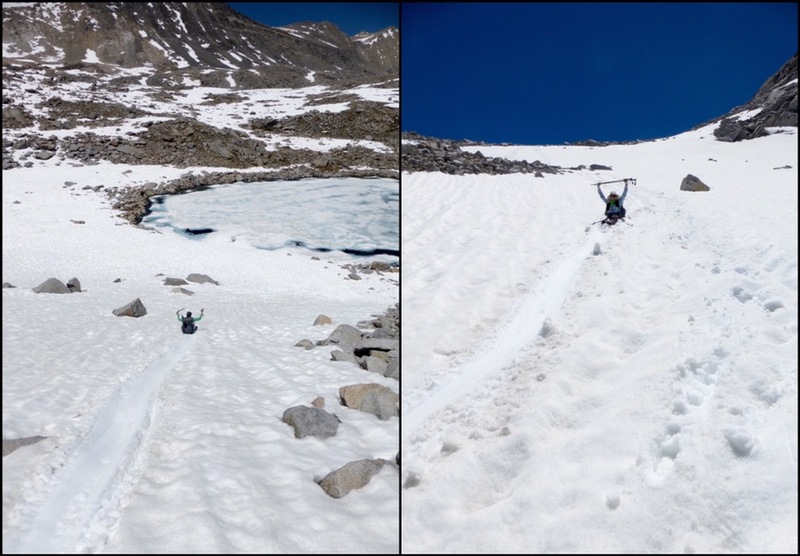 After lunch, we still needed to drop down some snow to another lake before heading across another basin to join the John Muir trail (also the PCT in this section). On the way down, I postholed (one of my legs fell through the snow). Postholing can be very dangerous not knowing what your leg may hit or how it can get lodged. This one was pretty bad. My whole leg went in and my shoe got wedged between two rocks and snow immediately compacted around it. I managed to get my foot out of the shoe and we had to dig down to get it out. Then Why Not and I glissaded and it was lots of fun! 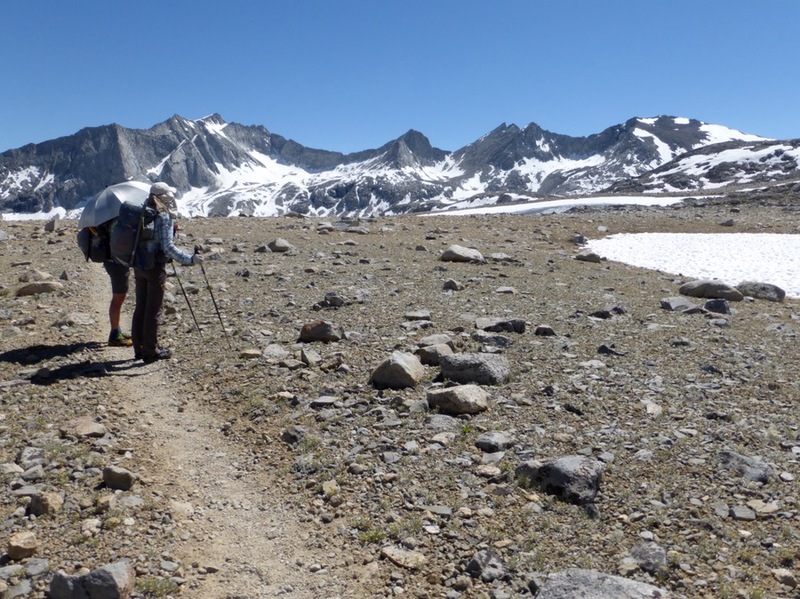 We connected with the JMT/PCT just before Mather Pass. 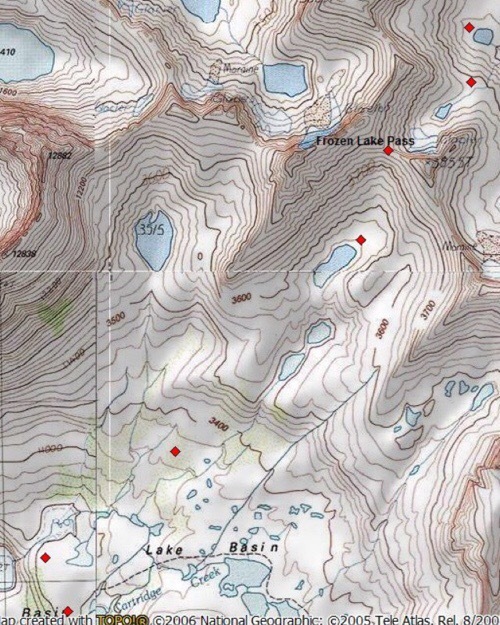 Our route overlaps with the JMT for 5.8mi here. We’ve all been over Mather many times. 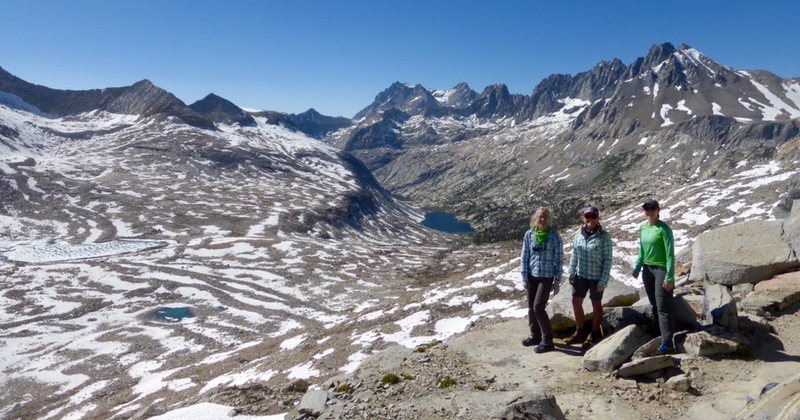 We do have a greater appreciation for those far off mountains we can see from the JMT now that we’ve been there and come over Frozen Lake Pass. 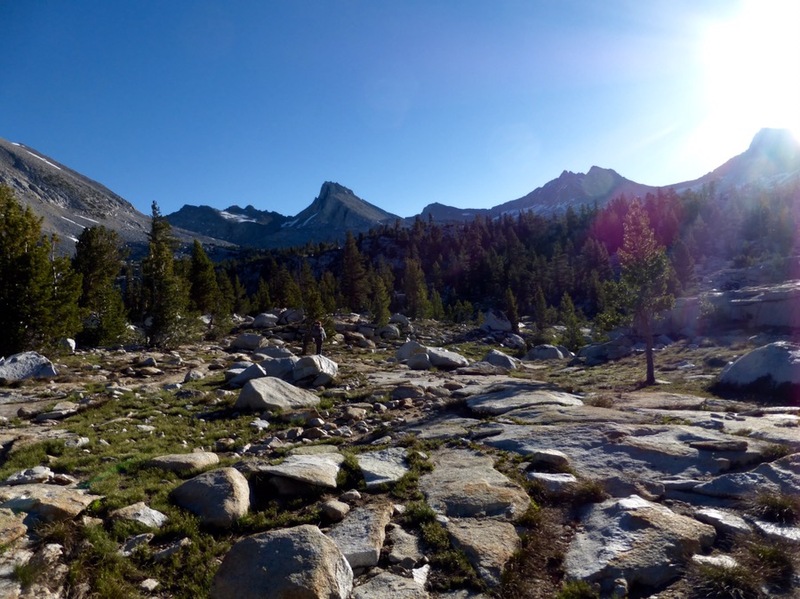 JMT/PCT with Mather Pass in the center. 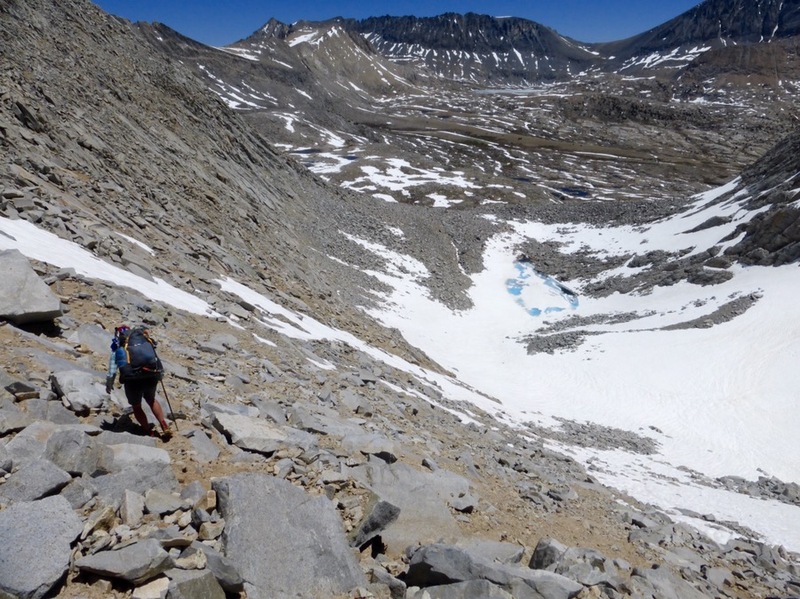 Looking back on Frozen Lake Pass (center) from the JMT. There was hardly any snow on the south side and we made it up pretty smoothly. My stomach got a lot worse though. While on top, we met our first other person, a PCTer named Wishbone and chatted a bit. Coming down the north side had sections of snow to navigate and the trail disappeared a few times, so that was more time consuming than anticipated. 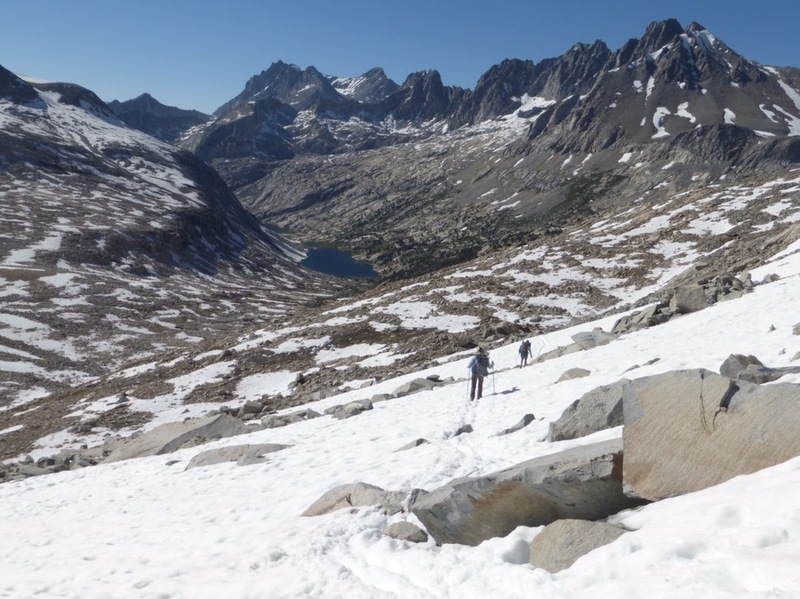 Going down Mather Pass and toward Lower Palisade Lake. 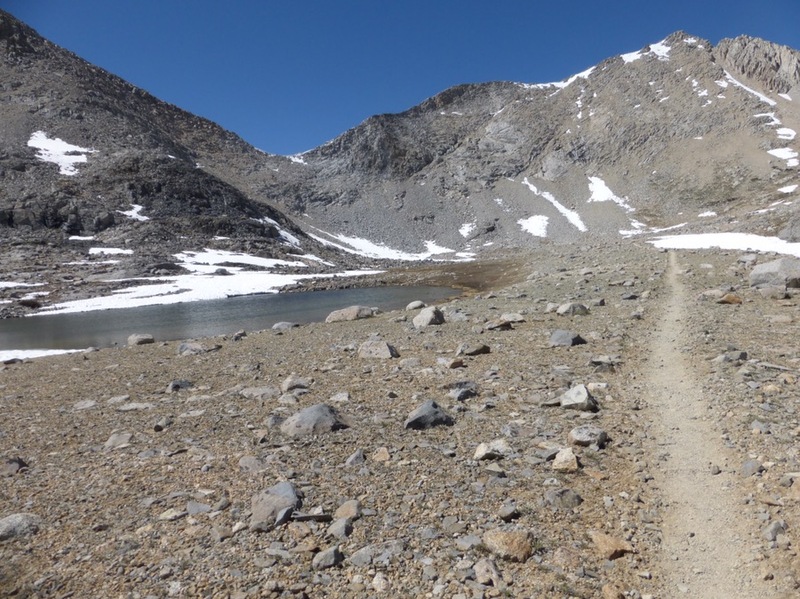 After that, we got to cruise along the JMT to Upper Palisade Lake for camp. We saw many JMTers and two guys who were major climbers. One of them, named Andrew, holds the speed record for the California 14ers. My stomach was cramping up badly and I knew most of it was mental. My body just reacts this way to stress no matter what it is, and adjusting to high elevation is definitely stressing my body. I decided to try music to get myself distracted. My MP3 player must have been left on because it had no battery life. Rockin’ was nice enough to give me her iPhone with a hiking playlist and I tried that for the last hour or so, but it didn’t help. We got to camp at 6:45pm, our campsite was yet another great view. Three nights in a row with a lake view! So I ate half my dinner and tried to down some water. The stomach cramping died down, but I felt like I had been on carnival rides all day. I ended up throwing up not long after dinner, but it wasn’t all my food thankfully. I do feel better and am hoping that was the worst of it. Why Not has amazingly had hardly any trouble adjusting. This is Rockin’s backyard, so she’s acclimated to the elevation, but before we started the trail, her allergies were acting up and she has had a cough and some limited lung capacity. Seriously, you’d never know it by how fast she hikes and how effortlessly she goes over the boulders. If my body doesn’t take to the elevation, this really might not be the trip for me. Sorry you’re unwell, that sounds pretty much like standard altitude sickness to me .. I reckon it will pass soon. Stick with it, the world will be a happier place in a couple of days. The scenery there is really awesome, just like the highest parts of the Pyrenees.. even better, if anything. I read your next update and I do hope the terrain doesn’t get the better of you – it’s nice when you get there despite it! Incidentally I know how frustrating it is when you take a picture of an appalling slope and on the photo it looks almost flat! Happens to me all the time.. “Look at this, practically vertical…” “Looks fine to me, what’s the big deal?” grr! Best of luck anyway and may all your decisions be good ones! I have so much empathy with you regarding terrain. Not my strong suit either. BTW it would be helpful if your blog site programmer could add a previous and prior post buttons to bottom of each post. Also my name is not auto populating between posts. Good to have feedback. We do have the before/after at the bottom of the posts. They are before the comments. Let me know if you still don’t see them. What does “not auto populating between posts” mean? My name, email and website are auto-populating. Is that a good thing? Not sure what your mean. I guess I should have replied directly to BeeKeeper. Just wanted you to know I am not experiencing the problem she reported. Keep those ice axes firmly in the snow as a ready brake while glissading! 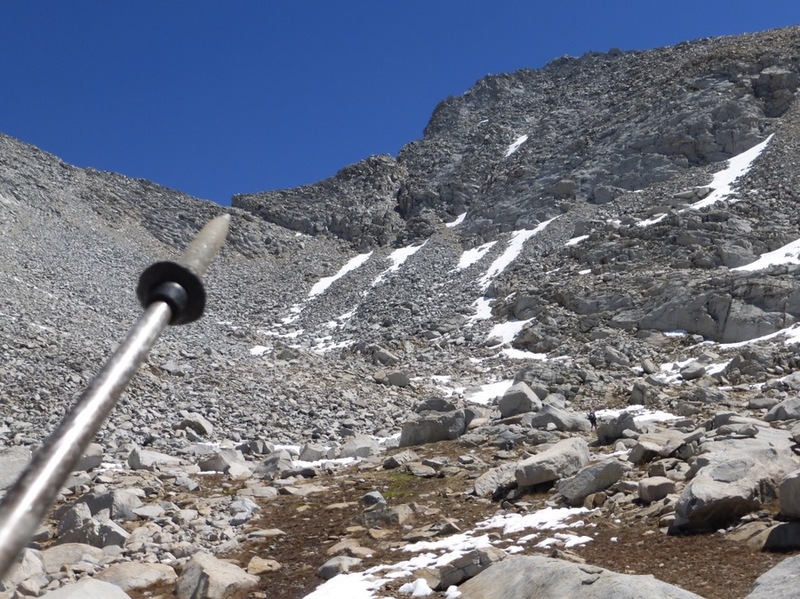 *Not sure you’ve been on one the PCT group hikes where I get all ranger-ish and start talking safety and checking people’s gear. Ask DNR sometime. Haha, there’s the Marmot we know and love! And speaking of snow, where is it all!? Yeah, I know. 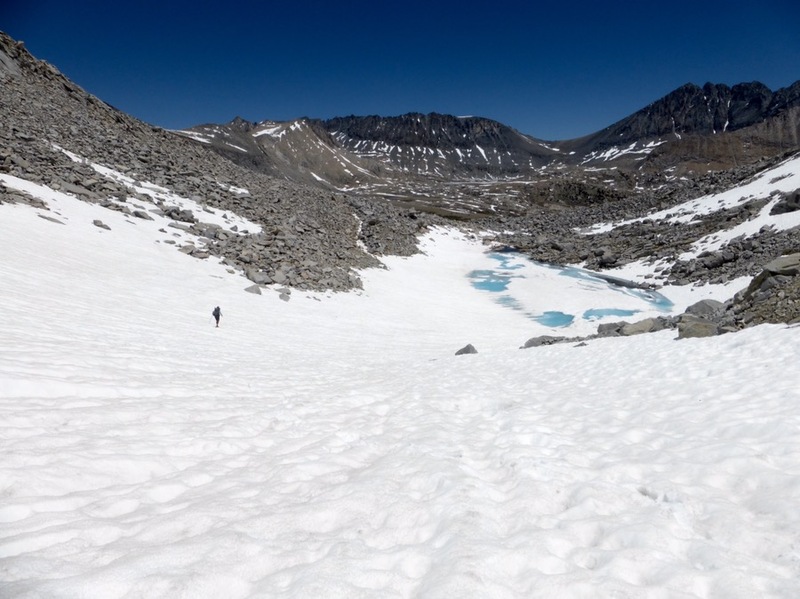 I do think that being introduced to the Sierra in all that 2011 snow has me thinking snow out here is normal and when it isn’t here, I feel like something is missing. It definitely puts things in perspective out on this hike as well. And by “where is the snow?” I don’t mean to disregard that the route is much more challenging with snow. Not at all. I just mean it ain’t 2011 anymore.